An idealistic suffragette... Miss Frederica "Free" Marshall has put her heart and soul into her newspaper, known for its outspoken support of women's rights. Naturally, her enemies are intent on destroying her business and silencing her for good. Free refuses to be at the end of her rope...but she needs more rope, and she needs it now. ...a jaded scoundrel... Edward Clark's aristocratic family abandoned him to die in a war-torn land, so he survived the only way he could: by becoming a rogue and a first-class forger. When the same family that left him for dead vows to ruin Miss Marshall, he offers his help. So what if he has to lie to her? She's only a pawn to use in his revenge. ...and a scandal seven years in the making. But the irrepressible Miss Marshall soon enchants Edward. By the time he realizes that his cynical heart is hers, it's too late. The only way to thwart her enemies is to reveal his scandalous past...and once the woman he loves realizes how much he's lied to her, he'll lose her forever. The Suffragette Scandal is the fourth full-length historical romance in The Brothers Sinister series. The other books in the series are: ВЅ. The Governess Affair (a prequel novella) 1. The Duchess War 1ВЅ. A Kiss for Midwinter (a companion novella to The Duchess War) 2. The Heiress Effect 3. The Countess Conspiracy 4. The Suffragette Scandal 4ВЅ. 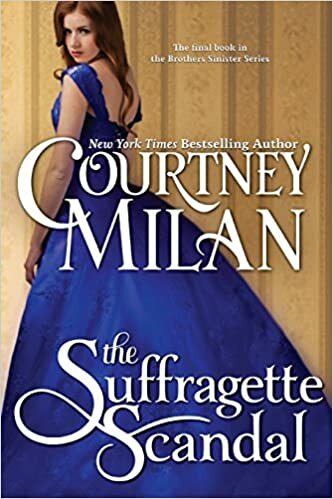 Talk Sweetly to Me (a coda to The Brothers Sinister Series) The Suffragette Scandal was originally listed as The Mistress Rebellion in some promotional materials, but the title has changed.